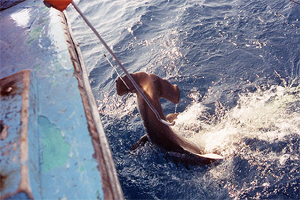 Shark fishing in the United States occurs in the Atlantic, Pacific and Gulf of Mexico both recreationally and commercially. Commercial shark fishers use methods that allow them to catch large quantities of sharks to be sold at market. Recreational shark fishers mainly catch shark for the thrill of the catch, trophies and/or personal consumption. Since the motivations of the commercial and recreational shark fisher differ so do their methods of fishing and the regulations they have to follow. 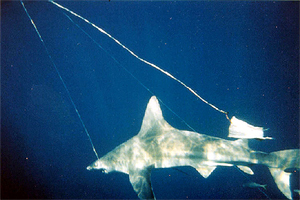 There are three main fishing techniques that commercial shark fishers’ employ in order to catch sharks, longlining, drift gillnetting and strikenetting. Longlining is most popular along the Atlantic coast and Gulf of Mexico and consists of a mainline to which the fishermen attach hooks. The mainline is attached to a hydraulic spool and is set out at the stern of the boat. A float is attached at the beginning of the line so that the end of the line can be found later. The longline is anchored to the ocean floor by attaching weights to the line after the first float. This is known as a bottom longline set. Longline sets without anchoring weights are known as surface or float sets since the mainline stays near the top of the water column. This allows the line to stay free floating near the surface, targeting pelagic and surface schooling sharks. As the mainline goes into the water, baited ganglions are attached. Ganglions consist of a hook, monofiliment line and a clip. Most longline sets are seven to ten miles long and consist of 600 to 800 hooks. Once the appropriate number of ganglions are attached, a weight (if needed) and a float are attached and the mainline is cut free from the hydraulic spool. The line is then allowed to soak for a period of time, usually overnight when sharks are most actively feeding. After the line has soaked, the mainline is retrieved at one of the floats and reattached to the remaining mainline on the hydraulic spool. The spool is then used to haul back the mainline and the gear attached to it. As the ganglions return to the boat, they are removed from the mainline and stored. When a shark is caught it is usually brought aboard, finned and carcassed for sale. The commercial market for shark is driven by the Asian demand for sharkfin soup. Fishermen can get up to 30 dollars a pound for the fins but only around 30 cents a pound for the meat. Once the entire mainline has been regained, the fishermen will go to another location and set the gear again or head back to the dock (usually depending on the number of sharks caught). Longline shark fishing trips generally last three to six days. Drift gillnetting creates a wall of netting in the water column to catch fish. These nets generally are 800 to 1000 fathoms in length and are stored aboard the gillnet vessel on a large hydraulic net reel. 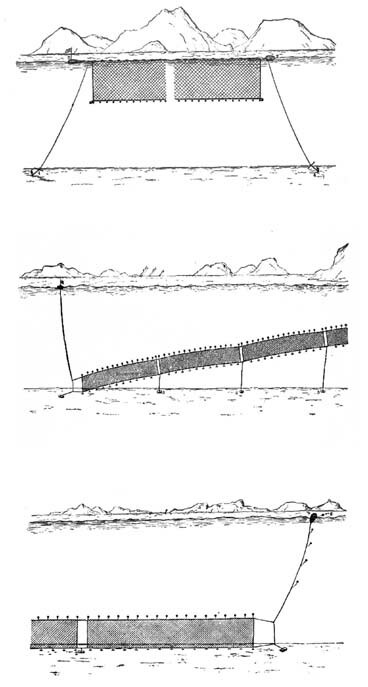 Nets are set in the evening and sets begin by tossing a radar-reflector buoy, which is attached to the net by several fathoms of rope, overboard at the stern of the boat. The boat is then driven forward slowly, allowing the net to be deployed into the water. How fast the net is set out is controlled by the speed of the boat and hydraulic reel breaking. As the net enters the water, it straightens itself out due to the lead and float lines. The lead line is a weighted line that makes up the bottom edge of the net. The float line is a non-weighted line allowing it to remain higher in the water column than the led line creating the upper edge of the net. 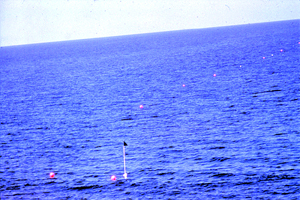 Buoy lines are clipped to the float line about every 60 feet. They are attached to floats and allow the net to remain at a certain depth in the water column. These lines range between 18 and 24 feet in length. This allows other vessels to pass over the gillnet without becoming entangled. The hanging line where the mesh of the gillnet is attached is also attached to the float line. The mesh is generally nylon and the stretched size of the openings for shark gillnets range between 13 and 19 inches. The mesh size of the gillnet depends on the type of fish targeted because the net is designed so fish swim into the holes in the net and then become entangled in the gills when trying to back out or escape. Therefore larger mesh size allows larger fish to become entangled while smaller fish are able to swim through the nets. Smaller mesh size captures smaller fish while larger fish are too big to become stuck in the mesh. The net is allowed to soak until early morning and haulback usually begins between 1 and 3 am depending on the expected catch. This allows enough time for the net to be retrieved near sunrise. Before the haulback begins the net guard is lowered over the stern. This prevents the net from becoming tangled in the propeller while it is being retrieved. Many boats have rollers at the stern, which assist the hydraulic net reel in retrieval and also lessen wear on the nets. The net is brought aboard according to the catch. 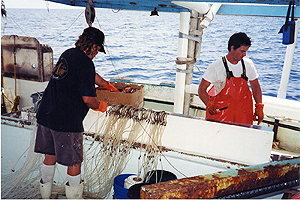 Small fish can be pulled on board in the net and removed on the deck. When larger fish are caught, the reel is slowed down so that the fish can be tied to the boat with a separate line and then winched aboard. Shark’s fins are usually cut off before they are removed from the net. The use of gillnets to actively encircle schools of sharks is known as strikenetting. Usually a smaller strikenet boat (~15ft long) containing the net and powered by an outboard motor is used to quickly encircle schooling sharks. Spotter planes flying overhead identify shark schools and their positions are relayed to the strikenet boat. Once the strikenet boat knows where the shark school is, the net is set as a half or full circle around the school. Sets begin by deploying a buoy float and releasing the net from the stern of the boat. The net is allowed to soak for about a half an hour and, before it is retrieved the strikenet boat, is often run rapidly inside of the net. This panics the sharks, running them into the net where they become entangled. Since strikenet vessels are usually too small to hold the catch, the net is usually retrieved by a drift gillnet vessel with a power roller system. The net is then hauled back using the hydraulic rollers in the same manner as a drift gillnet. While strikenetters and gillnetters basically use the same gear to catch sharks, their methods differ. Strikenetting is an active method of fishing for sharks since the net is placed around known schools of sharks. This allows for a reduction of bycatch and greater percentages of targeted species caught. Drift gillnetting is a passive fishing method since the net is placed in the water column where the fishermen think sharks will be, allowing a greater chance of non-targeted species to become entangled throughout the soak. Therefore since strikenetting actively encircles schools of sharks and has minimal soak times, bycatch is reduced in comparison to drift gillnetting where soak times are longer and nets are passively fished. 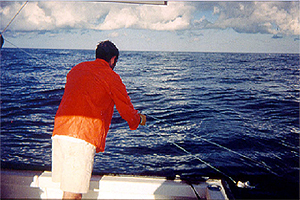 Recreational fishing for sharks has become more and more popular and is prevalent on both coasts of the United States. On the west coast and east coast, north of Cape Hatteras, makos, threshers and blue sharks are mainly sought after while blacktip, bull, blacknose, sandbar, tiger and atlantic sharpnose are caught south of Cape Hatteras and in the Gulf of Mexico. Recreational shark fishers mainly use rod and reel with one baited hook at the end of the line. Popularity of recreational shark fishing in the Atlantic region expanded in the 1970’s with both for-hire and private boats targeting large trophy sharks. Over the last 20 years recreational fishers’ target has shifted to smaller species of shark. This could be due to a depletion of larger sharks resulting from increased fishing pressure and a change in public attitude towards large sharks from eradication to conservation. Fishing regulations regarding commercial and recreational shark fisheries differ and both are continuously changing. 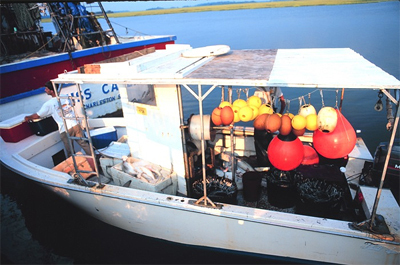 Commercial fishing regulations are created by the National Marine Fisheries Service’s (NMFS) Highly Migratory Species (HMS) division using the most reliable fishery stock assessment data available. HMS sets restrictions regarding what species can be caught, seasonal weight quotas, trip limit weight quotas and seasons for shark fishing. While trips in the commercial fishery are limited by weight quotas recreational fishers in federal waters are limited by numbers of sharks caught. Large coastal sharks are required to be over 4.5ft and only one shark per boat can be taken per day. Small coastal sharks do not have to reach a certain size but are restricted by number (one per person per boat per day). State regulations are similar to federal regulations in the recreational fishery but differ between states. Whether commercial or recreational, federal or state, shark fishing regulations are in constant change according to the most recent fishery data. This way the regulations can be adjusted in order to keep the fishery economically viable and sustainable for both commercial and recreational fishers.